Gerbil is the common name for any of the small to medium-sized rodents in the Old World Muridae subfamily Gerbillinae, characterized by a mouse-like appearance, generally long tails and long, narrow hind feet, long claws, very thin enamel on the incisors, and 12 thoracic and 7 lumbar vertebrae. These terrestrial mammals, once known simply as desert rats, are adapted to arid conditions and are distributed throughout Africa, the Middle East, and central Asia, largely in dry habitats, including deserts. Some in this subfamily are also called by the common name of jird. There are over 100 species in 16 genera of gerbillines. As murids, gerbils are in the same family as true rats and mice. In the wild, gerbils provide many values for the ecosystem. In food chains, gerbils consume nuts, seeds, fruits, grasses, insects, and bird eggs and are preyed upon by snakes, birds of prey such as owls, and small mammals. They also can play a role as pollinators of certain plants and likely in seed dispersal. Gerbillines, and in particular Meriones unguiculatus, the Mongolian gerbil, also provide a particular value to humans as a popular house pet and experimental animal, used for medical, psychological, and physiological research. Some species of gerbillines are considered major agricultural pests. As rodents (order Rodentia), gerbils are characterized by dentition specialized for gnawing, with a single pair of upper incisors and single pair of lower incisors that grow continuously throughout their life and must be worn down by gnawing. The incisors have enamel on the outside and exposed dentine on the inside, so they self-sharpen during gnawing. Rodents lack canines and first premolars, which creates a space between their incisors and their grinding teeth (molars). Within Rodentia, the gerbils belong to the superfamily Muroidea a vary large taxon that also includes hamsters, voles, true mice and rats, and many other relatives. They are the most populous group of rodents in the Northern Hemisphere and occupy a vast variety of habitats on every continent except Antarctica. They are often found in fossil occlusions of bones cached by past predators such as owls and other birds of prey. Gerbls, along with true mice and rats, spiny mice, and the crested rat belong to the family Muridae. Murids are the largest family of mammals, containing over 700 species. Murids typically have slender bodies with scaled tails, and pointed snouts with prominent whiskers, but there is wide variation in these broad traits. The dental formula of murids is . Gerbils comprise the murid subfamily Gerbillinae, which is the most diverse of the murid subfamilies ((Dewey 2004). Gerbillines have 12 thoracic and 7 lumbar vertebrae and have very thin layers of enamel on the incisors compared to the other murids. The dental formula of gerbillines is = 16, with the ecceptoin of the genus Desmodilliscus, whose members only have two lower molars on each side. (Poor 2005). Gerbils are small to medium-sized rodents, generally slender, and with tails making up about half of their total length. The body length of gerbils ranges from 50 to 200 millimeters (2 to 8 inches), while the tail lengths range from 56 to 245 millimeters (2.2 to 9.6 inches). The great gerbil, or Rhombomys opimus, originally native to Turkmenistan, can grow to more than 400 millimeters (16 inches) in total length. Weights of gerbils may range from 10 grams to 227 grams. They tend to have long, narrow hind feet and long claws. Ears may be long or short and fur also may be long or short, with the color of the pelage varying widely, including such colors as reddish, gray, olive, yellowish, dark brown, orangish and so forth (Poor 2005). Gerbils have large eyes and good vision. They have enlarged hind limbs and most are saltatorial and capable of leaping a large distance (Poor 2005; Dewey 2004). The word "gerbil" is a diminutive form of "jerboa", though the jerboas are an unrelated group of rodents occupying a similar ecological niche and somewhat similar appearance. The genus Meriones, which includes the gerbil most commonly kept as a pet (Meriones unguiculatus) contains many animals that also are known by the common name of jird. However, members of the genera Sekeetamys, Brachiones, and sometimes Pachyuromys are also known as jirds. Gerbils are terrestrial, Old World rodents, found widespread in [Africa]], the Middle East, and central Asia, including in much of India and in eastern Mongolia. Known once simply as "desert rats,' gerbils are adapted to extreme aridity, with adaptations such as producing concentrated urine and maintaining high relative humidity in their burrows (Dewey 2004). They often are found in dry, open habitats with sparse vegetation, such as deserts, steppes, mountain slopes, and grasslands, but some species also are found in moist woodlands, mountain valleys, and agricultural fields (Dewey 2004). Gerbils are terrestrial; some are good climbers. Depending on the species, gerbils may be diurnal, nocturnal, crespuscular, or active day and night. They build burrows for habitation, which can range from simple structures with a single entrance to elaborate networks of tunnels and multiple entrances and chambers, with different chambers for food storage, nesting, and excrement (Poor 2005). Gerbils species may be solitary and territorial, with individuals occupying their own burrows; or live in small family groups with each family defending its territory; or gregarious and forming large colonies with many individuals living in extensive tunnel networks. Gerbillines nesting together tend to be very social in interaction, grooming and chasing one another. They utilize a range of vocalizations to communicate, from squeaks, to grunts, to a clicking noise, to drumming their hind feet. they also used chemical means to communicate (Poor 2005). Individuals of most gerbil species have a life span of only three to four months in the wild, but in captivity some have lived up to eight years (Poor 2005). Gerbil species vary between those that breed year-round and those that breed seasonally. Litter sizes range from 1 to 13, with 4 to 7 common. Gerbils are born completely naked and blind and begin to grow fur about 1 to 2 weeks after birth and the eyes opening about 2 to 3 weeks after birth. Sexual maturity is reached between 10 and 16 weeks. Females have three to four pair of mammae. They brood and groom their young to about 1 month of age. Gerbil mothers have been noted to consume the urine and feces of the young. In some species, males care for and groom the young similar to the females (Poor 2005). Gerbils are primarily omnivorous or herbivorous. Their diet includes seeds, nuts, roots, fruits, grasses, insects, bulbs, and bird eggs, among other items. Some store large amounts of plant matter in their burrows, including up to 60 kilograms (Poor 2005). Among predators of gerbils are snakes, birds of prey such as owls, and small mammals. Some utilize camouflage for protection or block their burrow entrances (Poor 2005). The gerbil subfamily includes about 110 species in 16 genera. Gerbils were first introduced to the pet industry in 1964. These were the Mongolian gerbils, Meriones unguiculatus. Gentle, sociable, clean, and hardy animals, their value as pets was soon appreciated. Another species of gerbil has also been recently introduced to the pet industry is the fat-tailed gerbil, Pachyuromys duprasi, the only extant member of the genus. Also known as duprasi, the fat-tailed gerbil is smaller than the common Mongolian gerbils, and have long, soft coats, and short, fat tails, appearing more like a hamster. These rodents are very docile. Fat-tailed gerbils are, as their pointed snout would suggest, mostly insectivorous in the wild, but will eat also a variety of plants. In captivity, they are kept on normal basic rodent mix, used to feed Mongolian gerbils or hamsters. They are particularly fond of mealworms, crickets, moths, and almost any other insect, even beetles. In addition, they can also be given some vegetables and fruit, like carrots, cauliflower, chicory, and apples. Because fat-tailed gerbils originated in dry areas and are not used to food which has high moisture content, they can get diarrhea after eating too much fruit and vegetable matter. Several reasons for the popularity of gerbils as household pets include: The animals are typically not aggressive, and they rarely bite unprovoked or without stress. 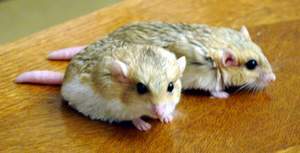 They are small and easy to handle, since they are sociable creatures that enjoy the company of humans and other gerbils. Gerbils also have adapted their kidneys to produce a minimum of waste to conserve body fluids, which makes them very clean with little odor. A common misunderstanding when purchasing a home for pet gerbils is they can live in housing designed for hamsters and mice. However, they have a drive to dig tunnel systems, rather than have them created for them, and the commonly plastic structure of hamster and mouse cages is inappropriate for gerbils due to their ability to gnaw through it very quickly. Plastic has the potential to cause serious health issues for the animal if ingested, therefore many owners refrain from having any plastic in the tank and rely entirely on wooden toys. Meriones unguiculatus, the Mongolian jird or Mongolian gerbil, is the most widely known species of the gerbil subfamily and is the usual gerbil species to be kept as a pet or experimental animal, when it is known as the "domesticated gerbil." Like the Syrian or golden hamster, it was first brought to the United States in 1954 by Dr. Victor Schwentker for use in research. Dr. Schwentker brought 20 breeding pairs to the United States from eastern Mongolia for scientific testing. Almost all pet gerbils today are descended from these 40. Gerbils were brought to the United Kingdom in 1964 from the United States. The first known mention of gerbils was that of the Mongolian gerbil in 1866, by Father Armand David, who sent "yellow rats" to the Museum of Natural History (Musée d'Histoire Naturelle) in Paris, from northern China. They were named Meriones unguiculatus by the scientist Milne-Edwards in 1867. This Latin name means "clawed warrior" in English, partly from the Greek warrior Meriones in Homer's Iliad. Meriones unguiculatus evolved on the semideserts and steppes of Mongolia. Its habitat there is mainly semideserts and steppes. Soil on the steppes is sandy and is covered with grasses, herbs, and shrubs. The steppes have cool, dry winters and hot summers. The temperature can get up to 50 °C (122 °F), but the average temperature for most of the year is around 20 °C (68 °F). 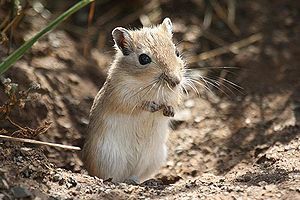 The Mongolian gerbil has long legs for jumping and running from predators, teeth to deal with hard seeds and plant matter, and water conservation techniques that allow them to survive in the arid climate, such as the ability to use dry food or stores of fat to generate metabolic water. Mongolian gerbils do not have many natural enemies due to the harsh climate. Most predators are birds of prey or snakes. Mongolian gerbils are diurnal, but return to their burrows for the coldest and hottest parts of the day. In the wild, these gerbils live in groups generally consisting of one parental pair, the most recent litter, and a few older pups. Only the dominant female will produce pups, but she will mate with multiple males while in estrus (heat). One group of gerbils generally ranges over 325–1,550 square meters (Template:Convert/Dual/LoffNa). A group lives in a central burrow with 10–20 exits. Some deeper burrows with only one to three exits in their territory may exist. These deeper burrows are used to escape from predators when they are too far from the central burrow. A group's burrows often interconnect with other groups. Due to the threat they pose to indigenous ecosystems and existing agricultural operations, it is illegal to purchase, import, or keep a gerbil as a pet in the US state of California. In New Zealand, the Mongolian gerbil is classed as a "prohibited new organism" under New Zealand's Hazardous Substances and New Organisms Act 1996, preventing it from being imported into the country. 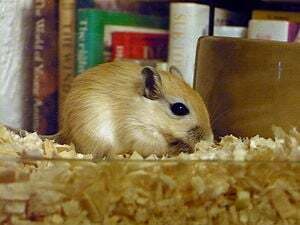 Among health problems encountered by Mongolian gerbils are misalignment of incisors due to injury or malnutrition, resulting in overgrowth and possible injury to the roof of the mouth; injuries from being dropped or falling, often while inside a hamster ball; and problems caused by neglect, including not giving adequate food and water. ↑ See 14 Cal. Code Regs. § 671(c)(2)(J). The prohibition imposed by the California Fish and Game Commission also applies to all other members of order Rodentia, except for "domesticated races" of rats, mice, golden hamsters, guinea pigs, and chinchillas. Dewey, T. A. 2004. Rats, mice, and relatives V. Pages 281-298 in B. Grzimek et al., Grzimek's Animal Life Encyclopedia, 2nd edition, vol. 16, mammals V. Detroit, MI: Thomson/Gale, 2004. ISBN 0787657921. McKenna, M. C., and S .K. Bell. 1997. Classification of Mammals Above the Species Level. New York: Columbia University Press. ISBN 0231110138. Musser, G. G. and M. D. Carleton. 1993. Family Muridae. Pages 501–755 in D. E. Wilson and D. M. Reeder, (eds. ), Mammal Species of the World: A Taxonomic and Geographic Reference. Washington, DC: Smithsonian Institution Press. ISBN 1560982179. Poor, A. 2005. Gerbillinae. Animal Diversity Web. Retrieved July 25, 2016. This page was last modified on 25 July 2016, at 22:34.